I can hardly believe that our house is officially done with cribs! 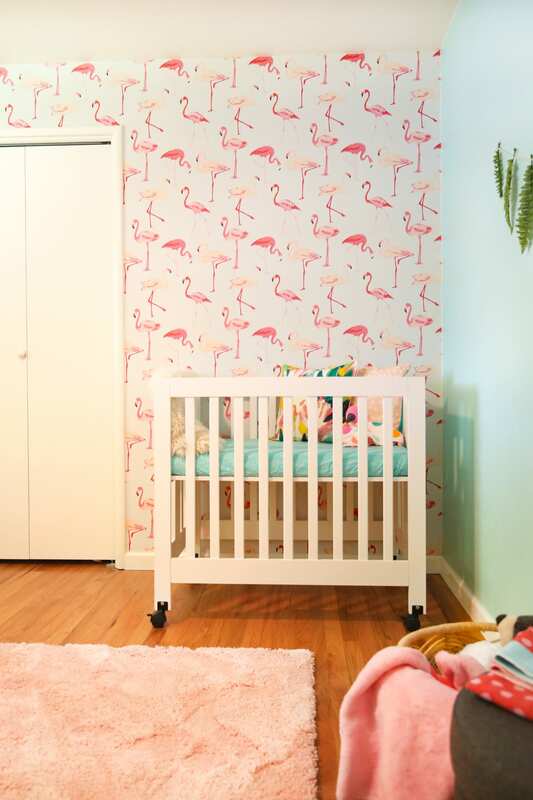 When you have a baby and start that parenthood journey, you can barely see the end of the week, let alone the end of a milestone like sleeping in a big kid bed. And yet, here we are. Maggie is totally done with the crib and loving her bed. 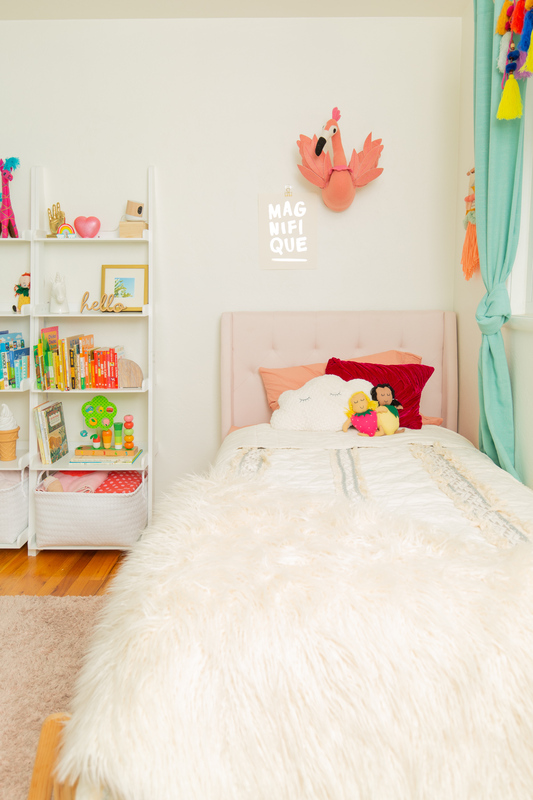 And if you’re in the same season, here’s how we transitioned our kids to big kid beds (and a peek at Maggie’s new room!). 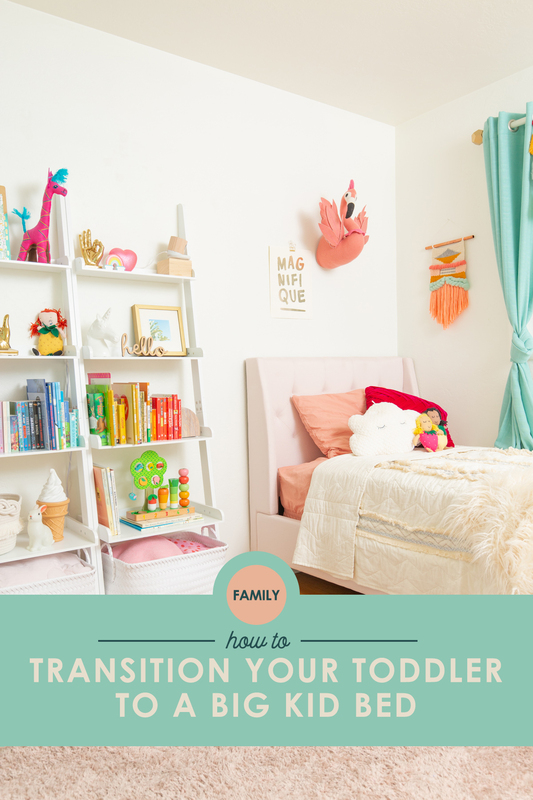 For starters, we began talking to our kids about their big kid beds a good month before they actually transitioned. We would talk about it like it was a big, exciting, grownup thing and tell them that it was almost time to trade beds because they were getting so big/smart/strong/etc. Secondly (and this one is crucial for keeping that good sleep schedule! ), we would set expectations about when and why it’s okay for them to get out of bed. We wanted to keep their good sleep habits and not have them popping out of bed all the time. 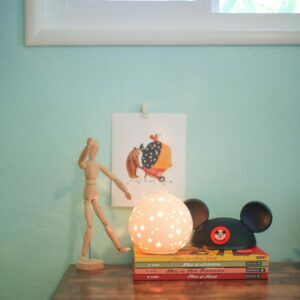 So we got some nightlights and timer switches like I described in this post and made them sleep timers. We started teaching them that when the light is on, it’s time to be resting in your bed (whether or not you’re asleep), and when it’s off, they’re free to get out of bed. Of course, we also teach them that it’s okay to get out of bed if they’re sick or hurt or need to use the bathroom. Maggie got so excited when we let her help us shop on Wayfair for her bed. Wayfair, if you don’t know by now, is where I always look first when I’m furnishing a room. They have SO many items (literally over 10 million) and great search tools to help you hone in on what you are looking for. Shipping is also always free over $49 so it’s kind of a no-brainer. 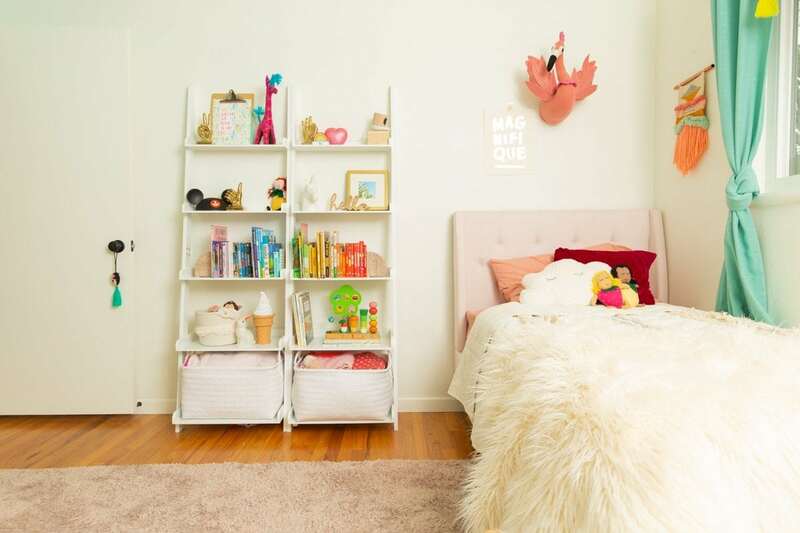 We gave Maggie three options and she chose this pink tufted bed, which is so dang cute. We also got her a Wayfair Sleep mattress, which I have to say I am truly impressed with. It’s the best quality mattress in a box I’ve ever tried, for sure. She happened to see the cloud pillow and the faux fur blanket while we were browsing the site and fell in love with them, so we snagged those too. I feel like allowing them to have some of the decision making power over their new sleep situation really helps them get invested and feel ownership over it all. And that, for us, led to a smoother transition for both kiddos. 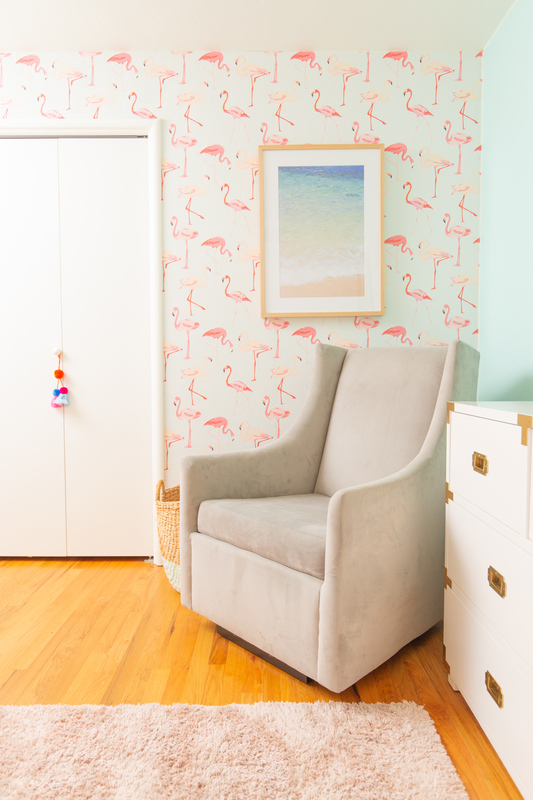 We learned with Henry’s big kid room that it’s smart to not only upgrade to a regular bed, but tweak the room so that it’s more easily accessible to a toddler. So we reorganized all of Mags’ books and favorite toys onto some easy-to-reach shelves that could be secured to the wall. Her favorite knick knacks go up high (and I couldn’t resist adding these gold hands, which she thinks are hilarious). We also revamped her closet in the same way that we did Henry’s, with shoe cubbies and low rods that the kids can access themselves. So she’s also learning to put her own shoes away and pick her own jacket in the mornings. It’s nice to give them the access to be able to be in charge of their own space a bit. So there’s Maggie’s new space! It’s always a fun challenge to use the things that we have and incorporate them with the new necessities. Her room is a bit crowded with the rocker still in it but she still loves to read books there, so we’ll let it be until the time is right. 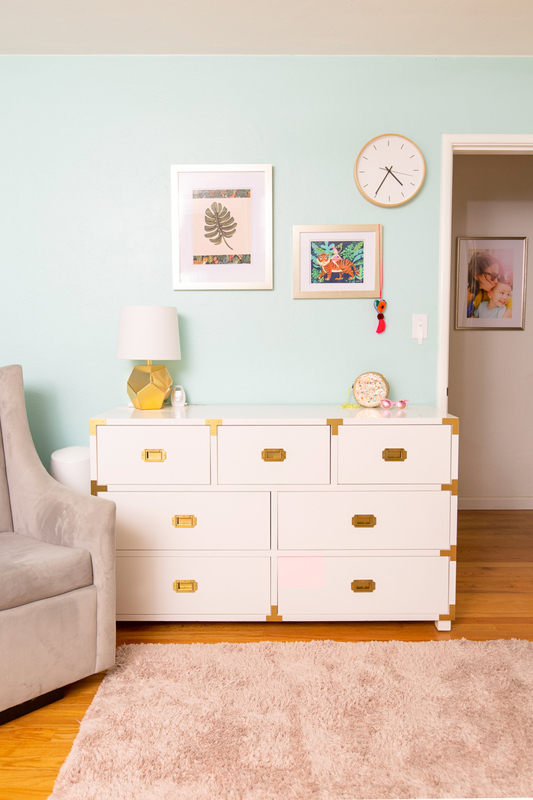 Her DIY play kitchen fits perfectly, and we kept all of her favorite art on the walls, adding a few new things. Here’s the before and after, just for fun. We had to flip the whole room around to accommodate the bed; her crib used to be on the opposite wall. Product for this post was graciously provided by Wayfair. Hahaha love that flamingo in flight! 😄 C’est magnifique! We just took down the fourth wall of the crib for our almost-3-year old, and I’m amazed at how well he’s been doing with it! He’s only gotten out of bed once when he was really upset with not wanting to take a nap. Otherwise he will stay in bed until we get him up. I’m very excited to move him to a big kid bed (very soon—as we have a little one due in two months and we’ll need that crib for the new baby). My boss told me that if you’re worried about your kid falling out of his new big kid bed, you can either install a railing, OR put a bean bag chair next to the bed to soften the blow.